The Tour de France isn’t just about racing; it’s about survival as well. It’s an achievement to cycle 3,400km in itself, but in that amount of time on the road, plenty of things can happen. You expect the odd crash, but a bus wedged under a finishing gantry is the kind of thing you have to endure as well. Apparently. If you want to see a man flick from indifference to mortification in an instant, seek out footage of the moment the OricaEdge bus driver wedged his vehicle under the finishing gantry. That gantry then served as a modern day stocks for the next 15 minutes while the driver sat there, head in hands, being pelted with metaphorical rotten veg. This had quite a big impact on the race, because the organisers initially told the fast-approaching riders that they would be finishing a couple of kilometres earlier. The riders wound it up, but just as they were approaching this new finish line, they were told that the bus had gone, so it was back to Plan A. At this point, one of the riders decided to try and break their collarbone by throwing themselves off the bike, bringing a stack of riders down with them and holding up about half the field. This was far from the only crash. Ryder Hesjedal fell, but early enough that he could catch up again, while Johnny Hoogerland added to his rich history of colourful accidents by cycling the wrong side of a barrier. Hoogerland bruised his liver and bust five ribs earlier this year when he hit a car, but will hopefully never top his 2011 Tour crash where a France Télévisions car shunted him into a barbed wire fence. Yesterday also saw the return of Hapless Froome. 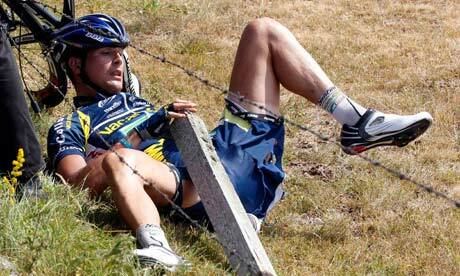 The Tour favourite managed to crash into a concrete barrier in the neutral zone before the official start. The final crash was the big one though. Most of the main sprinters were held up and Peter Sagan lost a bit of skin. Tony Martin, who was the big favourite for the first individual time trial, was so knocked about that he fainted twice after the stage. He has concussion and a bruised lung, but plans on riding today. Geraint Thomas also went down, which continues the strong run of form which has seen him crash in every major race this season. Marcel Kittel avoided the carnage, won the stage and therefore leads pretty much every competition. But not for long. The one jersey Kittel hasn’t claimed is the polka dot King of the Mountains one. This will be worn by Juan Jose Lobato Del Valle, who has a one point lead over absolutely everyone else in the race. Basically, he got in the day’s break and took the only mountain point on offer yesterday. Is really rather hilly. Here’s the profile.